Today, the team of Cryptic Studios and Perfect World Entertainment, are releasing the “Age of Discovery” expansion for Star Trek Online which brings in new content which expands on the CBS All Access series, Star Trek: Discovery. The update will feature two new voice actors to the game, reprising their on air TV roles – namely Mary Wiseman (as Cadet Sylvia Tilly) and Jeffrey Combs (as Thy’kir Shran, son of Thy’lek Shran from Star Trek: Enterprise). The update will also bring in a new random Task Force Operations system (for additional rewards), and a new Reputation Tier (all reputations will be extended to Tier 6 and will include upgrades to existing rewards, plus some new ones). 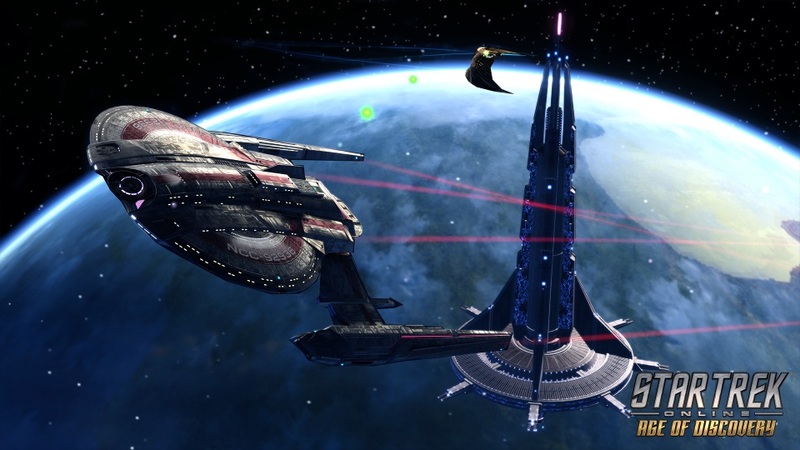 This morning’s press release also shared some additional details on additional “Age of Discovery” content that will be making it’s way into Star Trek Online, starting later this year. Today’s update is just the beginning for Age of Discovery, which will continue to bring Star Trek Online players even more Star Trek: Discovery content with future updates. In November, Captains can join the very first Featured Task Force Operation, centered around the pivotal Battle at the Binary Stars. Up next, players will be able to explore the mysterious forest planet of Pahvo from the Discovery episode “Into the Forest I Go,” during Star Trek Online’s anniversary event early next year.